A musician poses for his portrait at the Rocher studio in Chicago, Illinois. He is playing a large stringed instrument with a bow. I can not identify the instrument and assistance from knowledgable cabinet card gallery visitors would be appreciated. Note the fireplace and fancy chair in the background. 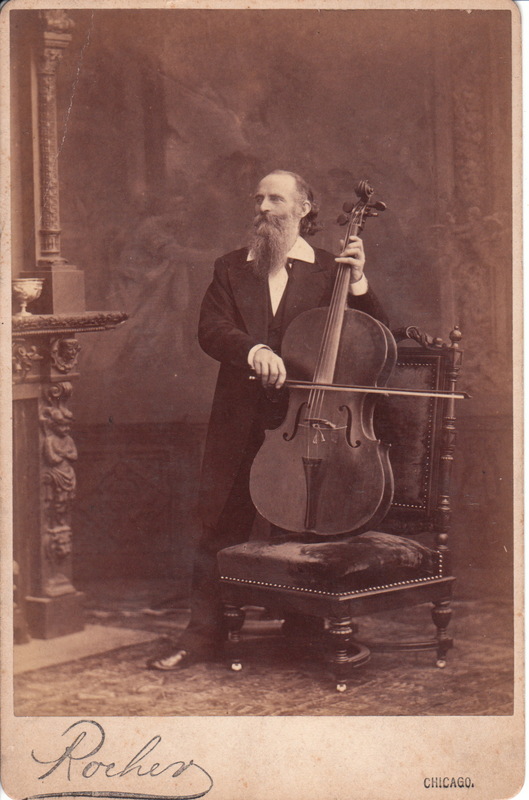 The musician is unidentified but is likely someone professional, and not a random person using the instrument as a prop for their portrait. In fact, Henry Rocher (1826-1887) was known for being a celebrity photographer. However, most of all, he is considered the one Chicago photographer who could compete technically and artistically with the great photographers in New York City. The great celebrity photographer Sarony, may have had an advantage by possessing exceptional ability to pose his subjects. Rocher’s nephew and disciple, Max Platz, was also quite a talented and successful photographer. Rocher was known to employ a number of women as operators, including “Miss Garrity” who was a successful photographer in Louisville, Kentucky and in Chicago. To view portraits by Miss Garrity, click on the category “Photographer: Garrity”. Rocher came to the US in 1856. He arrived from Germany, where he had originally learned photography.He was one of the founders of the Photographers Association of America (1880).